Serco Caledonian Ferries' CHFS bid team - Jonathan Riley, Steve Rowbotham, Fiona Irvine and Ruaridh Wilson. The man leading Serco’s bid to take over the running of ferry services in the Clyde and Hebrides says he and his team will return to Bute after bad weather curtailed their first visit. Jonathan Riley and his colleagues Steve Rowbotham, Fiona Irvine and Ruairidh Wilson called an early halt to their drop-in event at the 292 Club in Rothesay this week after the high winds of Storm Abigail threatened to disrupt the island’s ferry service. 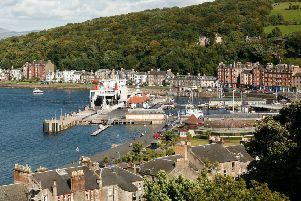 The bad weather also forced the quartet to cancel a meeting with representatives of Bute Community Council which was to have followed the public event. Before the session some ferry users had pointed out that a daytime-only event - the original times being from 11am to 5pm - prevented the island’s daily commuters from sharing their views face-to-face with the Serco Caledonian Ferries team. * More from the Serco team’s visit to Bute in the next issue of The Buteman - on sale from Thursday, November 19.